CGBSE 10th Result 2019: The result of CG Board class 10th high school examination will be released by CGBSE (Chattisgarh Board of Secondary Education). The Chhattisgarh Board of Secondary Education (CGBSE) is responsible for management and regulation of Secondary and Higher secondary education in the state. It was set up in the year 2001. This board conducts CGBSE Board class 10 and 12 exams every year. After the conclusion of class 10th high school examination, the result will be declared in the month of May 2019. The CGBSE Result of the high school class 10th examination will be released in the month of May 2019. The exam will be conducted in the month of March. The results will be announced online on the official website of the Chattisgarh Board. Students will be asked to enter their roll number to view the result. CGBSE 10th Result 2019: All the students who have appeared for class 10th Chattisgarh board examination will be able to view the results in the online mode by providing the correct roll number. The results will be displayed for both vocational and regular examinations. The official website of the Chattisgarh board of Secondary education: results.cg.nic.in. According to the reports of 2017, over 4,42,060 students sat for class 10th examination, out of which 3,86,349 students secured passing numbers. With the help of CGBSE class 10th results, candidates will be able to know their performance and also choose the stream for class 11th and 12th. 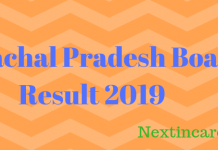 How to check CGBSE 10th Result 2019? Go to the official website of CGBSE: results.cg.nic.in. Or click on the link provided above. Select the link with class 10th Result 2019. Enter your roll number and click on the “get result” button. The result will be displayed on your screen. Save and download the same. CGBSE 10th Result 2019: The Chattisgarh Board will open a window where the students can get their results re-totaled. After the announcement of class 10th results, candidates can submit the request to get their result re-totaled. For this, the candidate must submit a form and pay the requisite fee. Candidates must, however, note that re-checking fee is to be paid individually for each subject. Once the re-checking is done, the Chattisgarh Board will publish the re-checked result. Students will also be able to check it online by submitting the Roll Number. 3 How to check CGBSE 10th Result 2019?